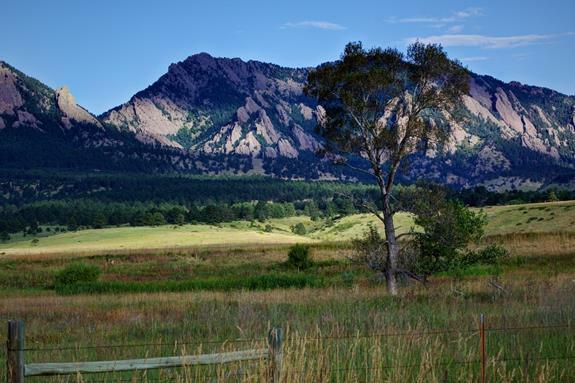 A ​Boulder Audubon trip to the South Boulder Creek Natural Area suggested that we could see Birds and Insects of Boulder’s Tallgrass Prairies​. We did. Led by Steve Jones, the mainstay of the Boulder Audubon Society, and less than two miles from my home, this trip was a must for me. The Rocky Mountains also rise up less than two miles from this Natural Area. ​We saw one of my favorite insects, a Monarch Butterfly. 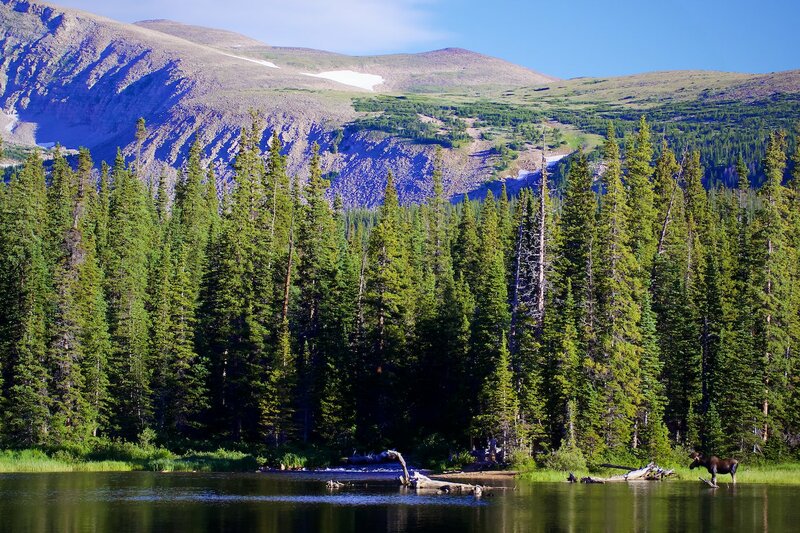 No caribou live within a thousand miles of Boulder County’s Caribou Ranch Open Space. ​It’s named for the nearby ghost town of Caribou, which in turn took its name from the Caribou silver mine that Sam Conger discovered near there in 1869. He thought that the animal he shot there was a caribou, but it was probably an elk. 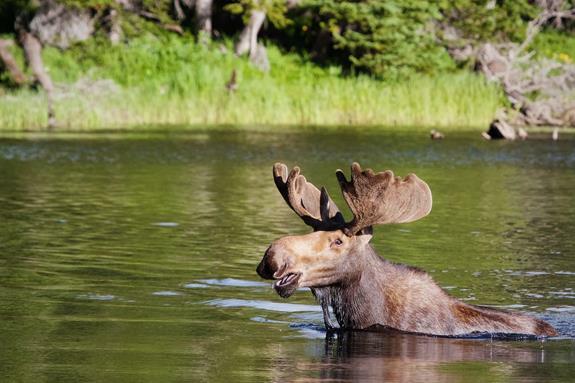 ​Until the last few years there haven’t been any moose living at Caribou Ranch either. ​Before 1978 only a few stray moose wandered into northern Colorado from Wyoming, but then Colorado wildlife managers began introducing them from Wyoming and Utah into North Park about 50 miles away on the other side of the Rocky Mountains. 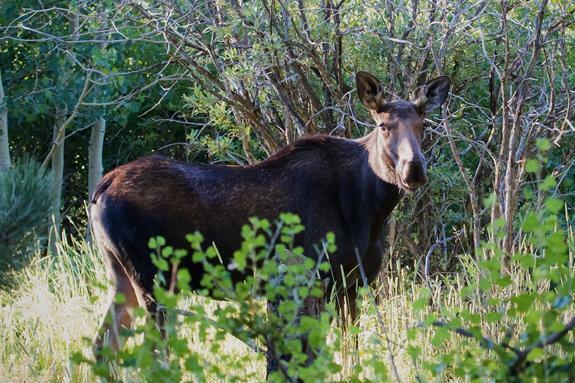 Since then, more than 50 moose have crossed the Continental Divide, and Sharon and I got a glimpse of a mama moose and her baby at Caribou Ranch last year. This time we got really close to a juvenile moose, which I like to think was the baby we saw earlier. 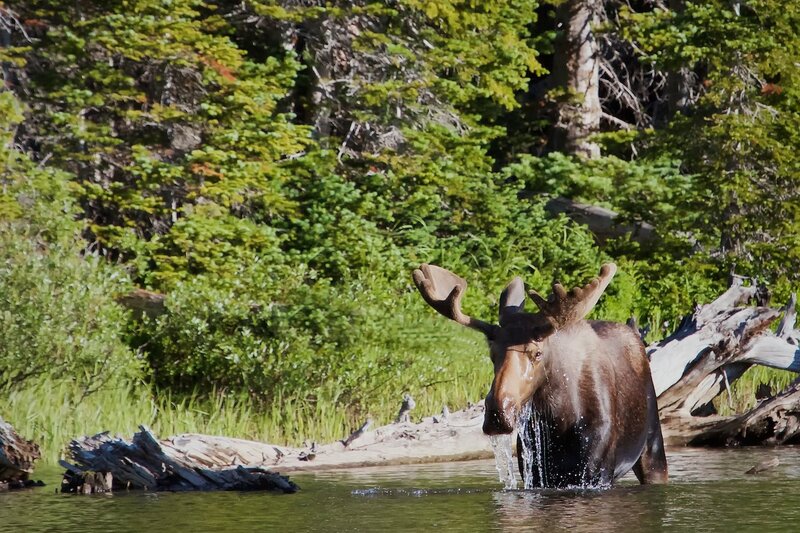 ​This moose was alone and eating its breakfast in peace only a dozen yards or so in front of me when I spotted it as it lifted its head to look at us. None of us had any fear, and the moose slowly ambled off into the willow carr. My camera was ready and I whipped it out. The first shot I got was this one and I was happy. For the past seven and one-half years I have been waiting for my best friend, John, to visit me at my apartment in Boulder. It was on February 24, 2008, that I bought a futon couch for him to sleep on in my living room. We have met here several times in that period, but he usually stayed in a hotel. I have also stayed at his home in California several times over the years. But this weekend he stayed with me. John is officially retired as a pastor of the United Methodist Church, but it was as a pastor that he came here this time to conduct funeral services on Sunday for a former parishioner. Today, however, John was free to spend the whole day with me, and we chose to go to the high country. 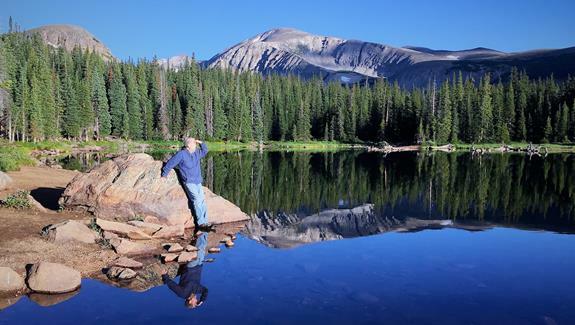 Right at sunrise we reached Brainard Lake at 10,300 feet, and what a glorious morning it was! While every morning is cold there, we had ample sun and unusually still air. In my experience this is one of the windiest places, but it had gone elsewhere this morning. The lake was totally still. When we arrived at the lake, John and I sat down for a picnic with my favorite cheese, Cowgirl Creamery’s Red Hawk. Several Gray Jays — also known for good reason as “camp robbers” — visited us. One of them immediately showed its good taste in cheese by joining our picnic. On Saturday I was fortunate to get with half a dozen feet of a pair of ptarmigan. 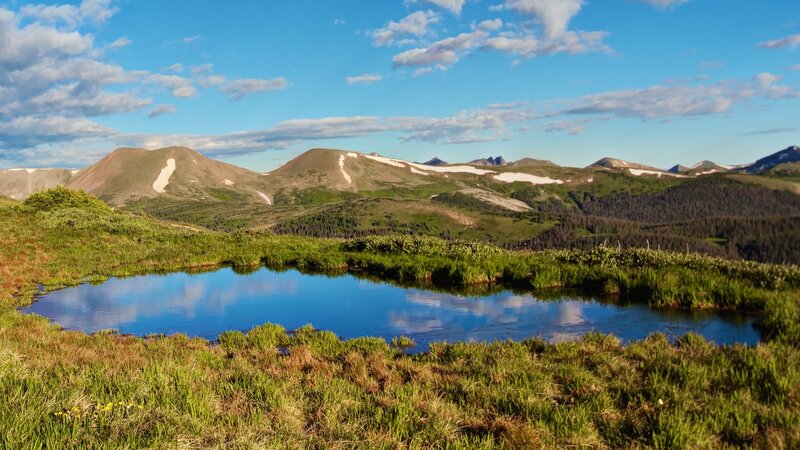 I was a member of a group of six who had special permission to hike miles up Niwot Ridge above the Mountain Research Station of the University of Colorado, Boulder, on a tour of the Boulder County Audubon Society. One of Colorado’s veteran birders, Bill Kaempfer, led the tour, which includes Sharon, two other women each named Linda, John Vanderpoel, who is a well-known birder who found 744 birds in his 2011 Big Year, which is one short of the record, and a photographer named Bob. Our tour leader had no difficulty getting permission for us to enter the restricted area since he is the university’s senior vice provost as well as professor of economics there. Most people probably celebrate their birthday with a big meal or with a party. But that’s not my style. Until now, I have ignored my birthdays as much as I could, but the one that came on Wednesday was a milestone. I turned 80. For weeks I had considered how I could most appropriately mark this event. Because the activity that interests me the most is getting out in nature on a hike, that was my clear choice. But which hike? 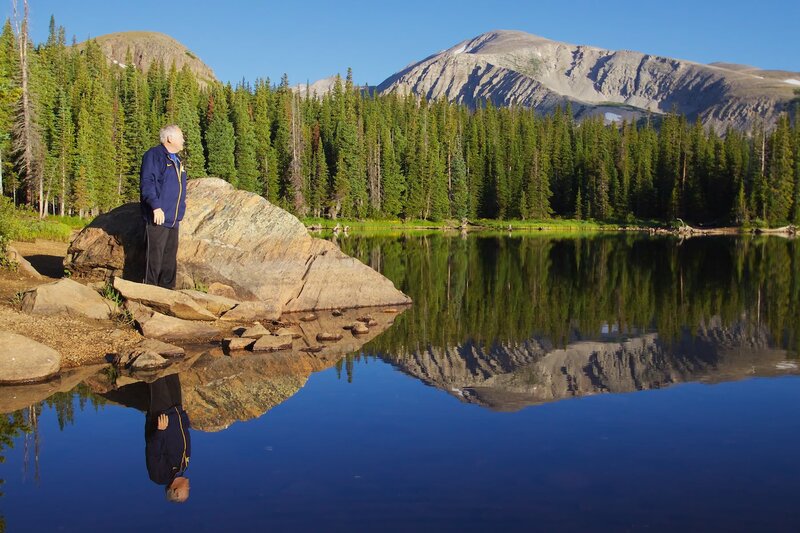 My favorite hike is the 4.1 miles on the Ute Trail from the Alpine Visitor Center to Milner Pass in Rocky Mountain National Park. It is almost all gently downhill, except and the end where it descends steeply. 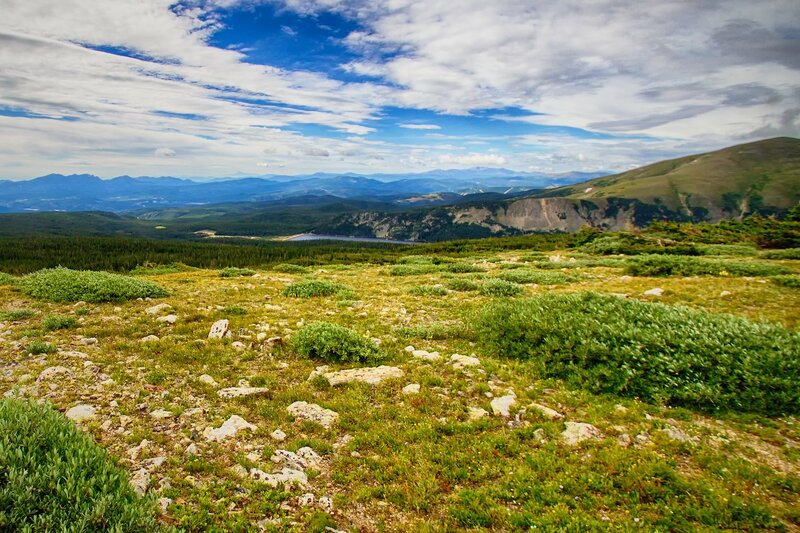 It’s also one of the least rocky trails in the Rocky Mountains. 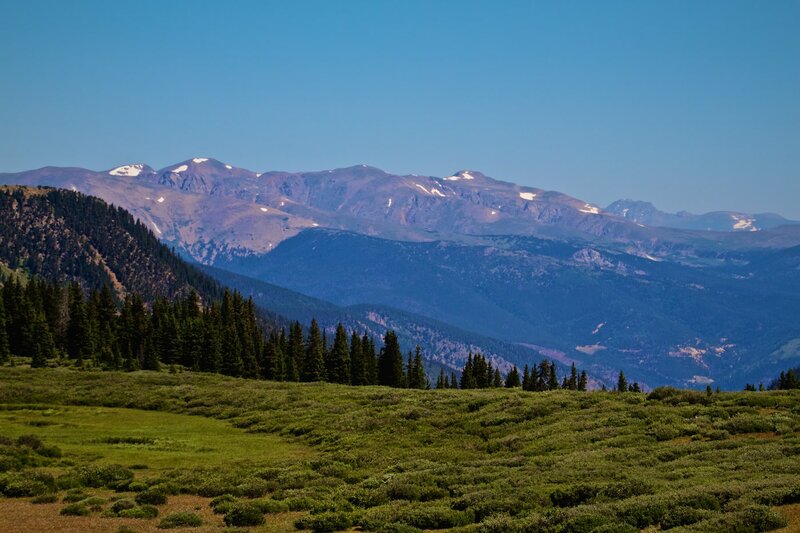 It starts at 11,796 feet and after 4.1 miles ends at 10,759 feet, so it’s mostly above treeline where the weather is almost always cold and often cloudy and windy. But August and September offers the best chance of acceptable weather, and I decided that this was my choice unless the prediction was for rain or snow. The 21-mile long birding tour is the best way to see birds and other wildlife in the Pawnee National Grassland. During a two-day camping trip ​there ​I logged 90 miles on its dusty roads and ​saw only three other vehicles. But​ I saw thousands of birds​, nine pronghorn, and one snake. ​Camping at Crow Valley, I was as close as possible to the tour route. Mornings and evenings found me hiking the campground’s Trail of the Mourning Dove and touring the grassland. The hot middays found me in the shade of the six cottonwood trees around my campsite, either reading or napping. The cool but not cold night was perfect for sleeping in my tent. 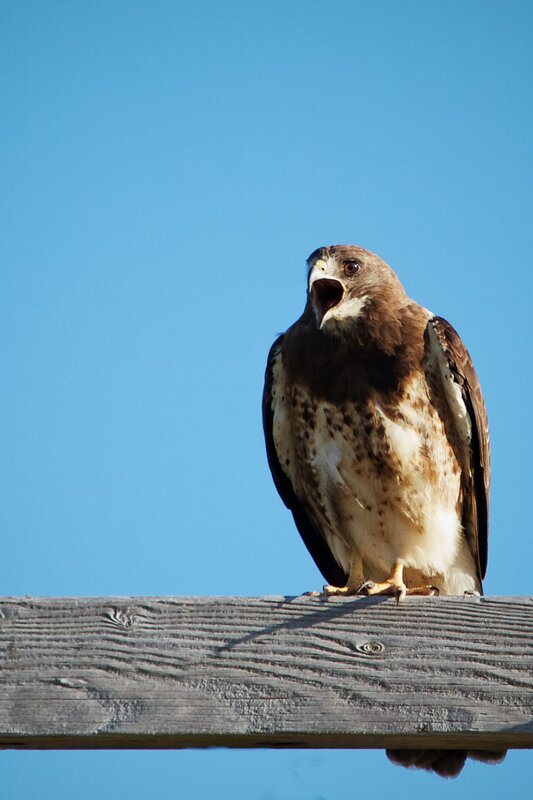 Raptors are some of my favorite birds, and the first one that I photographed was this Swainson’s Hawk in full cry. It was screaming to its nearby mate in its strangely high-pitched voice. Owls are also raptors, and three times I stopped to watch several Burrowing Owls near the tour route. Once I found a family of three together. Going above a summit may sound like an oxymoron, but it isn’t. That’s where I hiked this morning. Just as the sun came up, I got to the trailhead at the summit of Guanella Pass, which is in Pike National Forest at 11,670 feet above sea level. I arrived at 6 a.m., but the sun didn’t reach the trail where I was until half an hour later, and my thermometer read 35 degrees, and the wind was blowing. As I set off on the Square Top trail, I climbed gradually, reaching about 12,000 feet where I found a knoll overlooking a valley. Short of breath from the limited oxygen in the air more than two miles above sea level, I stopped, sat down against a welcoming rock, and meditated. I thought that the wind might distract me, but in fact it helped me to stay in the present. This is a big country where you can see for miles, but all the lifeforms are small. It’s well above treeline, so nothing bigger than willow bushes grow here. The treeline here is about 11,500 feet, so you know that you are looking down in this image that I took from near the trailhead. The flowers too are generally small, usually clinging to the ground where they aren’t so much at the mercy of the wind. But I saw hundreds if not thousands of this colorful flower below, probably the tallest and certainly the showiest. Today my continuing ascent to the high country reached 12,183 feet at the crest of Trail Ridge Road in Rocky Mountain National Park. The destination was a little known trail leading west from Medicine Bow Curve. 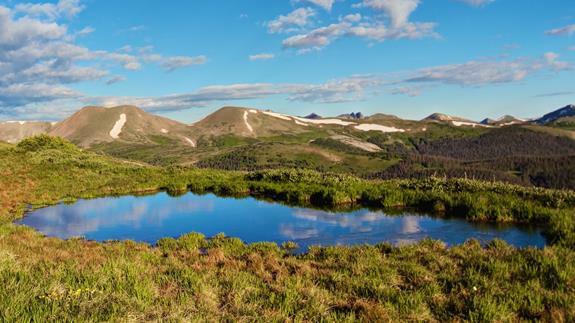 The Park Service doesn’t publicize this trail, which starts at 11,640 feet and rises probably no more than 100 feet in its short length of less than one mile. I don’t know how long it is because it’s not mentioned in any of the four guidebooks that I have for the park or shown on any maps, including the USGS topo map or Google’s Earth map. The trail is all above timberline where the vegetation is tundra. The trailhead is two hours from Sharon’s condo in central Boulder, meaning that we had to leave early to get started by sunrise. In fact, I woke up after a good night’s sleep at 2:45 a few minutes before my alarm was set to wake me. Arriving at the trailhead at 6:24, a few minutes after sunrise because we had stopped several times for the view the temperature was 45 degrees, much cooler than in Boulder, which is more than a mile lower. I was glad that I wore my down jacket and would have worn my gloves, except that they make photography a little more difficult. While this is one of our shortest hikes, requiring only 5,900 steps according to my pedometer, the rarified air takes our breath away even with moderate climbing. As short as the hike was, we remained three hours fully enjoying the weather, the scenery, the alpine tundra, the birds, and the animals. The weather was sunny with a light breeze, and only a few clouds on the eastern and southern horizons. ​Here are a couple of shots to establish the setting of today’s hike. 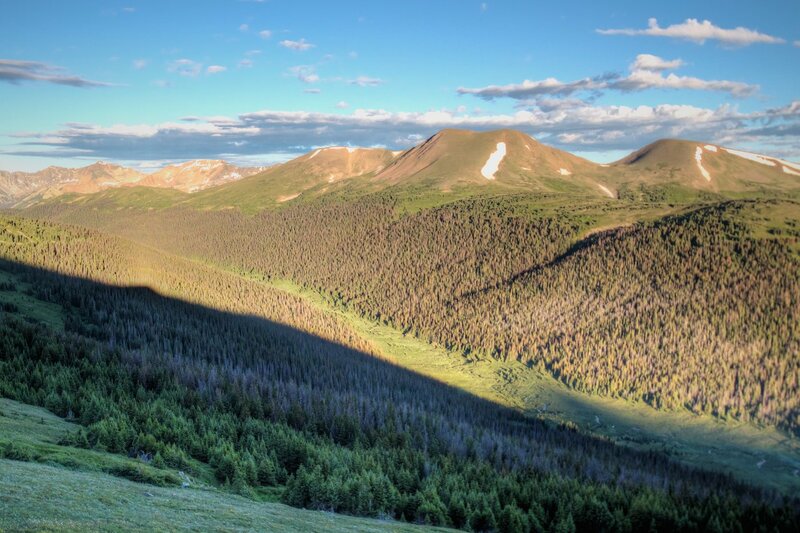 Sharon and I chose to hike the trail at Medicine Bow Curve i part because we wanted to see a bird that lives only in the high country, the White-tailed Ptarmigan, the smallest bird in the grouse family. We had seen one when we hiked this trail four years ago, as I wrote then at “Back to the High Country.”​ A Guide to Trail Ridge Road that I picked up at the Alpine Visitor Center today says that “Ptarmigan live on the tundra, but they can be difficult to see because they are exceptionally well-camouflaged​.​” But Sharon ​is an exceptional spotter, and she found then just beyond the end of the trail. As the temperature in Boulder climbed to 93 degrees today, I went even higher in the Rocky Mountains than any day this year. My friend Sharon, a friend of hers also named Sharon, and I drove up to Brainard Lake at 10,050 feet where the temperature this morning made me glad that I was wearing a heavy jacket even though the sun was out and we had little wind. We went there thinking that we might see bull moose feeding in the willows just south of Brainard Lake. We saw five just as we arrived at sunrise. But my friend Sharon spotted a young bull on the far side of the lake. While further away from us, we had clear views of him, so that’s where I directed my attention as long as he remained there. As I watched, the young bull moved west. Then, it swam across the lake. He swam to the south shore of the lake, where I was standing. He rejoined the herd. When people say that they love life, I think they are usually talking about the one life that they are leading. I certainly love what I get to do in my life, but when I say that I love life, I am talking about all the myriad forms of life. I find all of its forms wonderful and beautiful, sometimes in strange ways. Today I found a great variety of lifeforms on the 1.9 mile Ceran Saint Vrain Trail in Roosevelt National Forest. The trail parallels South St. Vrain Creek its whole way and the melodious sound of running water was my constant companion. The trailhead is three-quarters of an hour northwest of my home in Boulder. On my hikes I am working my way up in stages to the high country. Summertime in Colorado is mountain time, where it’s cooler than on the high plains. Today I went from 5,365 feet at my home to 8,365 at the trailhead, up exactly 3,000 feet. I’m glad that my car rather than my feet took me there. My biggest thrill on the trail was to see a species that had never seen before. 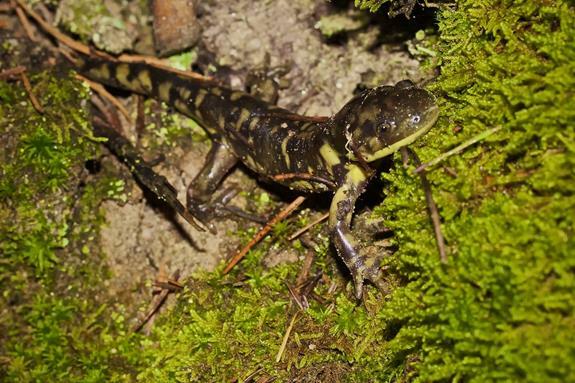 It happens to be Colorado’s State Amphibian and is one of the largest species of salamander in North America. This one is 6 to 8 inches long. That was a lucky find. But I was especially lucky when I stopped to take a shot of a Wild Geranium. I bee happened to check it out at the same time, but didn’t land.